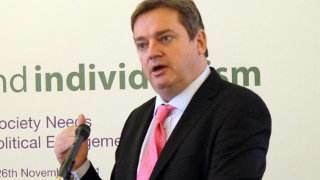 The Government's ‘liberal narrative’ must be overcome in order to achieve the ambitious goals of the Big Society, claimed Phillip Blond, who spoke at the Beyond Individualism Conference on 25 Nov, organised by Christian Concern, in association with UK and European partners. “Liberal individualism has led to a massive concentration of wealth and the disintegration of family relationships and human association: this reduction in 'social capital' has decreased well-being, health, trust and support for the most vulnerable. in the name of free markets we have created a massive concentration of wealth which has produced not modern liberty but medieval serfdom. He said: "After the economic crash and the social collapse of the riots now more than ever we need religious and moral voices re-admitted to public policy debate. The contemporary attack on Christianity as one of those voices is perhaps the most disturbing element of the new secular fundamentalism that seeks to police faith and drive belief from its central and proper role." Other contributors to the conference included Lord Glasman, Professor John Milbank and Bishop Michael Nazir-Ali. The event was organised by Christian Concern, the European Christian Political Movement and the Christian Peoples Alliance. UK-based organisations CARE, The Jubilee Centre, The Kirby Laing Institute for Christian Ethics and THEOS were also partners in the event.